I recently rewrote most of kdev-python's code completion code, as it was a huge mess (it relied largely on regular expression matching, which just isn't powerful enough to do this properly). The result is less buggy, easier to maintain, and has unit tests (yay!). In the process, I also implemented quite a few features which I want to post a few screenshots of. There's a second issue I want to talk about in this post: A major problem which remains for kdev-python is the documentation data, that is, the way the program gets information about external libraries, for example functions and classes in those libraries. I'd love to have some help here -- if you want to help improve kdev-python, this is a great point to start! There is no knowledge required about kdev-python's code base, or even C++ (all that is to do here can be done in python). Read more below in case you're interested. Another note: kdev-python now has its own component on bugs.kde.org. Please report any issues you might encounter there! Besides the increase in maintainability, a number of features have been added or improved in code completion. As you can see, if the cursor is inside a function call which is passed as an argument to another function, you'll get information about both functions (this works with an arbitrary depth, of course, not just with two functions). 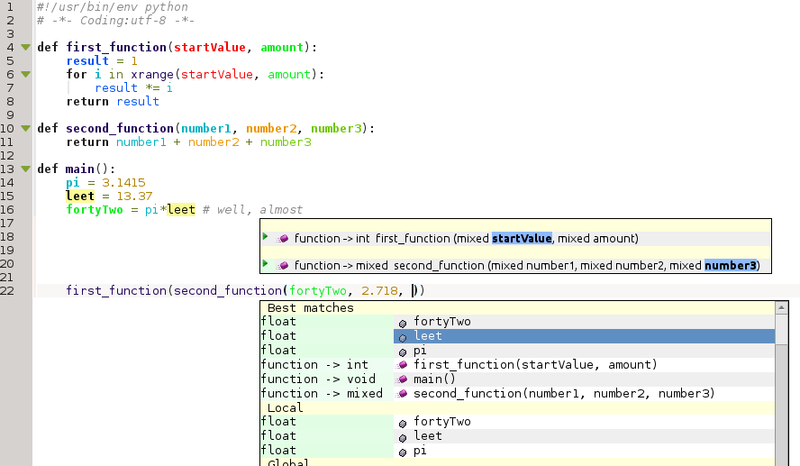 The parameter which you're currently editing is highlighted in blue for both functions. Notice the algorithm which guesses the variable you actually want to iterate over, which is not obvious just from the code the line contains. This is probably pretty useless, but it was easy to implement, so I did. Listing multiple encodings could be discussed, but doesn't everyone use utf-8 anyways? Note: I will use the word "documentation" in the following sense here: it means not only the docstring or help text, but also basic information like "which classes are there in this library", "which methods does this class have", "which parameters does that function take", and "which type of object does that function return" -- in other words, all important information about a library's public API. This information is necessary for various things, most importantly semantic highlighting and code completion. The first type of problem are libraries which are written in python, but heavily rely on fancy python magic to set themselves up (for example, modify __builtins__, or iterate over lists of functions to do something with them); it will probably never be possible to determine the correct outcome of those setup scripts without actually executing them. Modules which currently suffer from this are, for example, os and parts of django (especially the ORM, but that will need some special-case handling in any case, which I have yet to think about) -- kdev-python is not intelligent enough to understand what those do internally. Even worse are libraries which are written in pure C. By default, kdev-python cannot do anything about those. Python has the "pydoc" tool, which can be used to obtain parts of the required information. However, pydoc will (partially) execute the code it analyzes, which is a no-go. If you wanted to use pydoc in an IDE, you'd have to heavily sandbox it, which I don't want to do. Thus, I dismissed using pydoc, at least at run-time. The current solution is simple: Files similar to the header files C/C++ has are shipped with kdev-python in case the information kdev-python can extract from the files that are shipped with the library is not sufficient. An example where this works really well can be seen in the QtGui / QtCore modules; the documentation for those is provided in kdev-python/documentation_files/PyQt4/QtGui.py. Victor Varvariuc wrote a script which generates those files from the Qt documentation a while ago, and it works great. So, where's the problem, then? The problem is, PyQt is well-documented in a systematic way, and other libraries aren't. Look at the python standard library, for example: There's no machine-readable documentation available which would even list classes and functions; function return types are, if at all, only documented in prosa text (yes, of course, strictly speaking, a function in python has no return type; but in most cases the type a function will return is actually fixed, and in those cases it would be useful to know it). The situation is similar for other important projects like numpy. All classes and functions, and their members must be listed. For functions, at least the names of the parameters must be included, the types are nice but not so important. 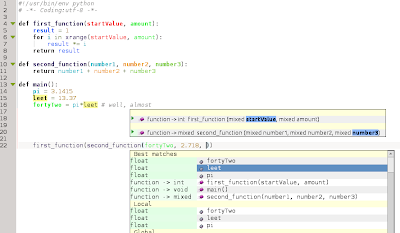 For functions a proper return type is very important (if you do i = button->icon(), and then want to access the properties of i, and icon() doesn't have a return type, no completion or highlighting can be done -- basically, even single functions with wrong return type can break highlighting and completion of large parts of a program's code). Constants and their types must be listed. That information then needs to be encoded in a python script (create empty functions / classes / etc. which just contain "return int()" or similar statements -- see kdev-python/documentation_files for plenty of examples). Some effort has been made in the past to support various libraries (for numpy there's something that parses the online docs and converts that to such header files), but the overall situation is rather miserable. The worst thing is probably that not even the standard library is supported properly. First of all, I don't really know a good solution for this whole problem. If you have an idea, or know how other IDEs solve that problem, please tell me! I think eclipse uses pydoc or so and collects the information when you configure the interpreter, but the result is not good enough that I'd want to copy their behaviour. There's two important packages I have in mind for which the issue could probably be solved well in the "header files" way described above: the whole python standard library (os, sys, random, math, ...), and numpy. If you're interested in helping, please contact me, for example in IRC in #kdevelop on irc.freenode.net. Or just write an email. I don't understand the problem, but python is a good language to use in Linux because there are a lot of people who use it, which translates into a lot of people to help. Just look at the dependencies in the deb packages from dotdeb.com. Almost all of them require python. Will this work in Kate? What do I have to compile to use this? No, it won't work in kate. It's a plugin for KDevPlatform, which makes it usable in any application based on that (currently KDevelop and Quanta, where the latter is somewhat unmaintained). To use it, you'll have to compile kdevplatform, kdevelop, and kdev-python (all can be found on projects.kde.org). The inspect module (in the stdlib) has some bits that might help in that regard, in particular inspect.getmembers(), inspect.getargspec() and so on. There are also other bits like isclass(), ismodule(), isfunction() and so on. I wonder if the additions made by Sage would work? On second look, I don't think it would be easily decoupleable. PyCharm solves this problem really really well. It's worth a look. Since I'm a freelance Django developer, I've bought the license because it makes me much more productive. PyCharm does a lot of symantic parsing / code analysis in the process. (don't know whether it's an embedded python interpreter, or code parsing). They also generate .py stub files for all .so files, including the __buildins__ and __future__ module. - remember the return type. - with 'assert isinstance()' the next code knows the type. - with 'if isinstance()' the if-branch knows the type. - detailed stuff like 'self.__class__.foo' also works. - it understands kwargs.pop('name'), and gives the name= as parameter suggestion. - it sometimes understands (*args, **kwargs), as it can look up where they are passed into. - unknown symbols are highlighted with an offer to add the import (Alt+Enter). that is _really_ valuable. - some detections are assisted with known defaults. A "Go to definition" on a default model actually takes me to that line. I guess they have implemented "add_to_class" as assignment function for a django Model class. A similar thing can be one with true Django views. The first 'request' parameter is always an instance of a HttpRequest object. Since 'urls.py' lists all views, this can be implemented. In fact, PyCharm allows a "go to definition" in the 'urls.py' or INSTALLED_APPS, or MIDDLEWARE_CLASSES, which all list the symbols as string. That said, I think you can achieve a lot already with static analysis, and further finetune it with some known defaults. One other thing, I honestly really don't like that second "best matches" box. I actually find it really distracting with all it's matches based on inferred return types. I'd rather have a simple clean autosuggest like PyCharm offers, unless there is a very good reason this makes me more productive. Typically you already know what variable or function you want to type there, don't you? Typing the first 2 letters is often enough to get the autosuggest anyway, so why bother with that large box in the first place? It takes takes an equal amount of keystrokes to get the suggestion. I also wouldn't highlight functions as "function -> mixed foo(int arg)" because it isn't python syntax. Why not "def foo(arg: int) -> unknown" ? > __buildins__ and __future__ module. > - remember the return type. > - with 'assert isinstance()' the next code knows the type. > - with 'if isinstance()' the if-branch knows the type. > - detailed stuff like 'self.__class__.foo' also works. > the name= as parameter suggestion. > it can look up where they are passed into. > an offer to add the import (Alt+Enter). > that is _really_ valuable. > For example, it auto completes Django models. I guess they have special support for Django, haven't they? This is on my todo list, too. Do they have such python stub files for django, do you know? > all it's matches based on inferred return types. > this makes me more productive. Set it to "always minimal completion" in the options, then. By default, while you're typing, only the minimal completion widget is shown. Did you try it out? I think it's fine as it is. The "best matches" box is another thing... it's used to sort some items which are likely good matches at the top of the list, before all the alphabetically sorted items. What's the issue you have with that one? I don't quite understand the problem, I think. I find the "def" a bit out of place... but I'll consider changing that to something more reasonable, yeah. Hi, great to get your response! > > __buildins__ and __future__ module. > Do you have any idea how they do that? As far as I see, you can probe `__builtins__.__dict__` within the python interpreter. The __future__ module is just a .py file in the stdlib. >> - remember the return type. At this point, PyCharm knows that `x` is a SomeObject type. > Yes, that's planned already. > I guess they have special support for Django, haven't they? Yes, that's something they also advertise with. I don't think they have stubs, but rather have some hard-coded hints or assist the parser to recognize Django specific features, such as symbols in INSTALLED_APPS, urls.py and the `cls.add_to_class()` code. The last one is basically an "assignment operator", just written differently. Those features are understood at the lowest level possible, so it also works for your own classes. I think in practice, you'll know where you'll miss auto completion, and start adding that. :) Template tags come into my mind for example. > the list, before all the alphabetically sorted items. > understand the problem, I think. I kind of doubt it's usefulness, while it takes quite some space, distracting from the actual job. I'll see how it works out for me. > a .py file in the stdlib. That has been supported forever in kdev-python. Okay, if they have specialized django support, then it's easy to beat me. That's something I still need to start writing. It will be easy to do some special-case handling in the code for django... I'm just wondering whether there's a more generic approach (which would not make it necessary to modify the program code if you want to support further libraries with similar features). > quite some space, distracting from the actual job. > I'll see how it works out for me. Yes, please keep me updated on that one. I didn't even consider that it might be seen as a bad thing by some people. The main reason I introduced it was that I wanted to have matching locals sorted first, over the global variables. I find it far easier to hit the right item then, because it will *usually* be sorted first. Hi, great work, it finally works! Should I still be using the 1.3 branch with kdevplatform 1.3.x?